If you have not been paying attention to the tropics this week, now is the time to start. 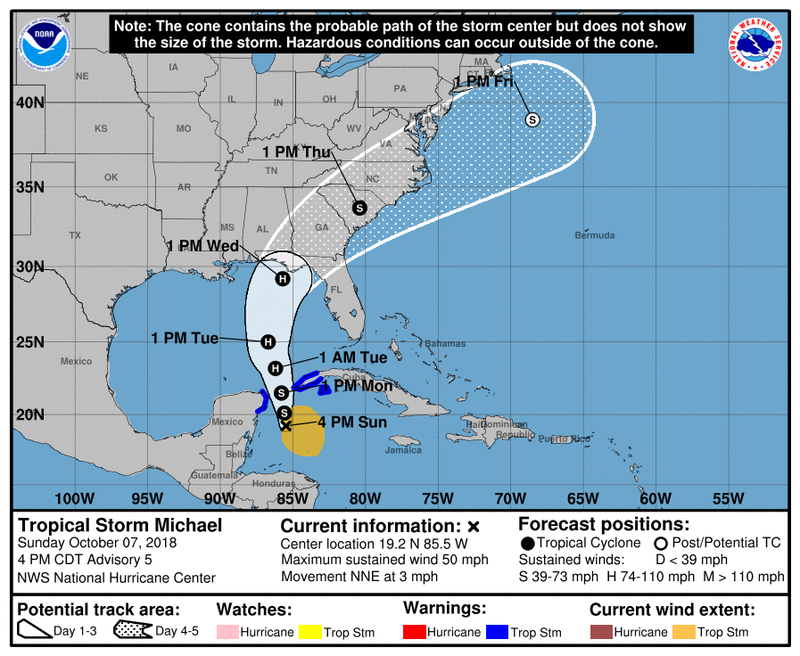 Tropical Storm Michael has formed in the Gulf of Mexico and is expected to make landfall along the Gulf Coast Wednesday afternoon. Because of the unusually warm water in the Gulf of Mexico, it has the potential of coming onshore as a Category 2 storm with winds near 100 mph, although that could decrease as the hurricane pulls in drier air from off of the land. The current forecast cone for Michael includes almost all of Georgia in the potential path as well as southeastern Alabama, northern Florida, and almost all of the Carolinas. And keep in mind that the cone only describes where the center of circulation will go, and impacts could be felt outside the cone. Because I am traveling, I will not be able to post regular updates on Michael. Please follow the National Hurricane Center at http://www.nhc.noaa.gov for more information and your local National Weather Service office for local forecasts of the latest predicted path of the storm and the impacts it will have on your local weather. Keep in mind that the forecast track and intensity will be adjusted every few hours as new observations and model results come in, so even if you are not currently in the forecast cone, you could be tomorrow. Michael will be moving much quicker than Florence and so rainfall amounts are not expected to be nearly as high as what fell from Florence, but some isolated areas could see as much as 6 inches and areas along and to the right of the path could see widespread 4 inches or more. Unfortunately, this includes areas in the Carolinas that are still picking up from the flooding of Florence. In Georgia we have been fairly dry and that will help reduce the impacts of flooding to some event, although local flooding is definitely possible due to heavy downpours. 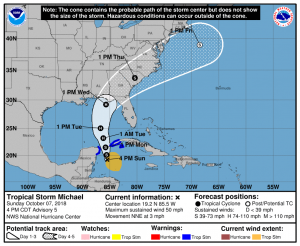 The higher forward speed of Michael will mean that winds on the right side of the path are going to be higher for farther inland than in Florence, and hurricane-speed winds could still be present as the storm moves inland over Georgia. Isolated tornadoes could also occur to the right of the path in the spiral bands of the storm. The worst impacts will occur to the right of the storm’s path, but since we don’t know where that will be yet, if you are anywhere near the area of the forecast path you should be prepared for the worst. If you live in anywhere in or near the forecast cone, you need to be preparing now for the storm. 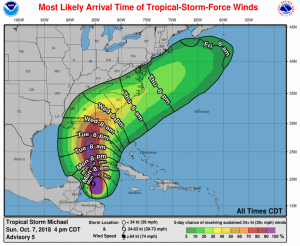 Winds will start to pick up by Tuesday night near where the storm is expected to make landfall and tropical storm force winds are likely to reach northeast Georgia by Wednesday evening. Your preparations should be done by Tuesday at sunset, especially if you live near the coast. Preparations include moving equipment and animals to safe areas away from low-lying and exposed areas, putting loose equipment inside so it won’t get blown away, harvesting standing crops that could be affected by high winds, baling hay while it is dry, and preparing for power outages when the high winds topple trees and power poles. The rain should be beneficial for the dry areas of Georgia but the timing is not ideal for farmers who need dry conditions to harvest their crops now. Fortunately, the rain should last for only a day and then drier (and cooler) conditions should return to the area as the storm accelerates to the northeast. Previous: Georgia Climate Project: How can we improve resilience of potable water infrastructure?